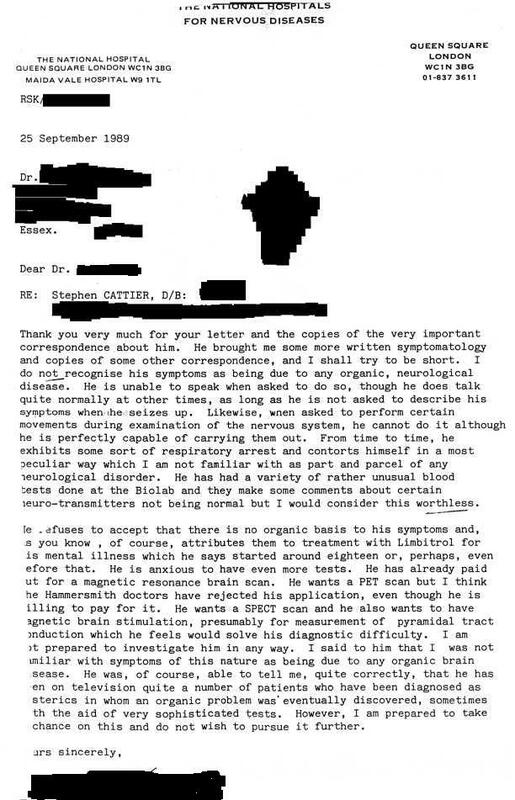 Dr. Kocen, consultant neurologist, Stephen Cattier consultation report, National Hospital 1989. Dr. Kocen, consultant neurologist, National Hospital, report of 1989 NHS consultation. I could not help putting him off when I walked into his office replying in a sarcastic tone, "Yeah," when he exclaimed that I walked into his office alright. That was unfortunately my alien mouth and body syndrome in play. He failed to realise why I would not let him take my pulse in that I could suffer a relapse if touched, and I think he appeared to loose interest after that and started writing. I could not explain myself properly. However, I subsequently appealed through the then Secretary of State for Health, Kenneth Clarke, and my case was referred to Dr. Kocen and Dr. Ron, consultant psychiatrist whom I had seen in 1990, but they did not change their minds. Timidity prevented me asking what else Kenneth Clarke could do.